Apple will launch ads in response to the debut of Microsoft’s latest operating system, due on Oct 22. 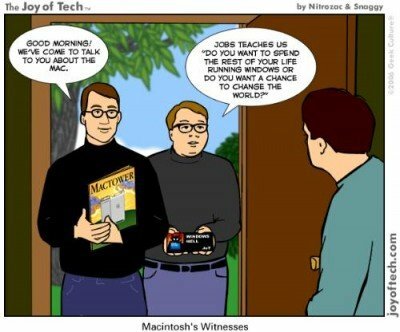 The spots are expected to criticize Windows and portray the Mac as a superior platform. Apple views the launch as an opportunity to lure Windows users to the Mac. However, Windows 7 has earned rave reviews from some, including known Apple advocate Walt Mossberg of The Wall Street Journal. UPDATE: Watch the 3 Mac ads here. Of course Apple will… They have rode Microsofts shirt tail since the beginning. I’m really tired of that slimy Steve Jobs and his problem riddled OS. More lies from Apple…what else could anybody expect? Are Apple employees really THAT stupid? “Apple views the launch as an opportunity to lure Windows users to the Mac.” I am a long time Windows user and all those ads do to me show that people coming up with these ads are total idiots without any imagination. That doesn’t make me love Apple, it just makes me hate it even more.